Cluster analysis is a statistical technique that identifies groupings, or clusters, of assets whose returns are relatively correlated within each cluster and relatively uncorrelated across clusters. Cluster analysis can be used to help identify complementary groupings of assets or funds such as those based on sectors, growth/value, instrument type, manager style etc. and to identify groups of assets which provide a required level of portfolio diversification. There are several widely used methodologies for performing correlation cluster analysis. The Hoadley Correlation Clustering Analyzer uses the most powerful of these methodologies: Agglomerative Hierarchical Clustering (AHC). The Correlation Clustering Analyzer requires only one input: a standard correlation matrix. As a first step, the application will produce a "heat map" of the input (unclustered) correlation matrix. A heat map depicts the strength of the relationship between assets using different colours. Normally very little clustering would be evident unless the assets had already been pre-grouped by some characteristic such as industry or size. 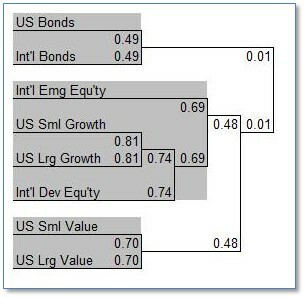 An example of an unclustered correlation matrix is shown above. The Correlation Clustering Analyzer then performs a hierarchical cluster analysis and the columns and rows of the correlation matrix are re-ordered into clusters of assets. A "heat map" of the clustered matrix can help reveal clustering -- assets which are more highly correlated with each other than with assets outside the cluster. The clustered correlation matrix example on the right shows that, with equities, style (value/growth) predominates over size (large small). Even with this artificially small example these relationship groupings would not be obvious by simply looking at the unclustered correlation matrix. 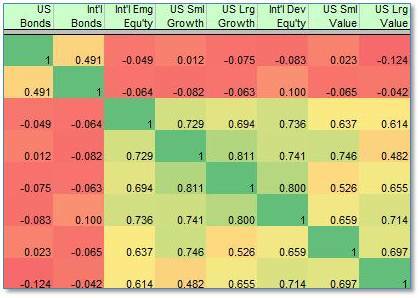 When a correlation matrix consists of dozens of assets/sectors/funds similarities between groups based on correlation are virtually impossible to discern without a formal cluster analysis. To further clarify the relationships between assets and groups of assets, the clustered matrix is also displayed as a hierarchical cluster diagram (example below). This reveals, graphically, the relationships between groups, or clusters, of assets as well as the relationships between individual assets. The relationship strength of each cluster and group of clusters can also optionally be shown on the cluster diagram (not shown on the example below). 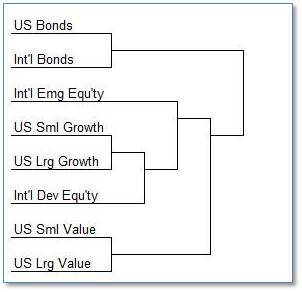 With the example used on this page, the hierarchical cluster diagram shows that US growth equities (both large and small companies) are more highly correlated with international emerging and developed markets than with US value equities. Clearly a valuable insight into the diversification benefits of these sectors. The hierarchical cluster diagram is supplemented by a Step-By-Step analysis of the process showing how individual assets and groups of assets are progressively combined into a hierarchy of clusters. The analysis is sequenced by the strength of the relationship between assets and clusters of assets: those with a relatively strong relationship appear near the top of the step-by-step list; those with a weaker relationship appear near the bottom. The clustered matrix and hierarchical cluster diagram shown on this page were produced using real data but for clarity the example has been limited to eight sectors. Normally correlation matrices would be larger than this. As matrix size increases the hierarchical cluster diagram and Step-by-Step analysis become indispensible tools for revealing complex relationships between assets, funds, and sectors. The Correlation Clustering Analyzer application provides a number of tools to facilitate a typical multi-stage approach to asset allocation/portfolio construction. Under one widely used multi-stage approach, asset weights are firstly allocated within clusters -- groups of assets, or sectors, which share similar characteristics. Weights are then allocated across clusters, treating each cluster of assets, including its volatility and correlation with all other clusters, as a single entity. Asset allocation within and across clusters can be based on the same or different methodologies. eg Risk-parity for one cluster; Mean-Variance Optimization (MVO) for another. The Hierarchical cluster diagram enables clusters to be selected interactively or automatically based on correlation strength. Parent levels in the hierarchy are highlighted as each set of assets is selected and inconsistent selections are flagged. The interactive nature of the application facilitates the examination of different clustering strategies. Once one or more clusters have been selected the clustered hierarchy chart is transformed by the application into a correlation matrix as shown below. Each correlation matrix for a cluster (highlighted in a different color) would be used to allocate asset weights within the cluster. 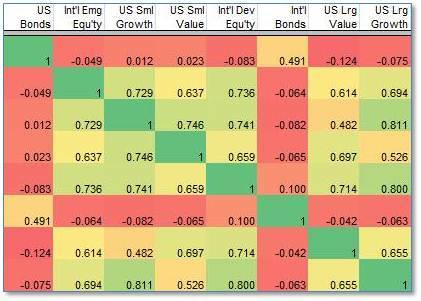 Following asset allocation within each cluster a merged correlation matrix of clusters would normally be produced. A merged correlation matrix, consisting of clusters rather than individual assets, is required to enable cluster weights to be allocated across clusters (eg using Risk-Parity or MVO) while preserving the weights allocated to assets within each cluster. The example illustrated on this page shows how the 8 x 8 individual asset correlation matrix has been consolidated into a 3 x 3 correlation matrix of clusters. For clarity, the example on this page is artificially small. A more realistic 30 asset examples is included with the Cluster Analyzer application. For detailed systems requirements, including supported versions of Windows and Excel see systems requirements. The Hoadley Correlation Clustering Analyzer is available for download to users who have purchased the Hoadley Finance Add-in for Excel and are still within their one year free download period.